A bun is classically elegant. A glamorous evening out, a [[Images of Wedding Hair Styles | wedding]], the prom -- whatever the event, elegant hairstyles are called for and you want the one that gives you the most sophistication and class while still being absolutely you. There are many fabulous dos from which to choose, so all you need are some good ideas and a great stylist. Up until the 1920s, a girl became an adult when she no longer wore her hair down. Hair worn in an updo is the ultimate in sophistication. The bun is the basic, but timeless, updo - classic, classy and effortlessly chic. It's also a simple do that you can make by just pulling back your hair and twisting it up, then securing it with bobby pins. You can also use a bun-maker, a plastic device around which you wind your hair before clipping. The advantage of the bun-maker is that your bun is almost guaranteed to be tidy and stay in place. A bun can also be called a chignon, which of course lends it that much more sophistication. Some people differentiate the two by referring to the chignon as a softer and looser bun, but it's basically just a bun in French. 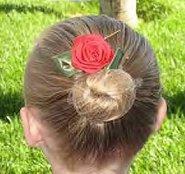 Then there's the French twist, sometimes referred to as a ballerina style. This sleek, beautiful style looks effortless, but in fact can be difficult to do well on yourself without a lot of practice. If you need it to look perfect for a long event, you should have it done professionally. There are books from which you can get step-by-step instructions and photographs to guide you, but if you want to learn how to do it well, you're best off having someone teach you. Any updo can be augmented with side curls, long curls, tendrils and bangs. You can also use any number of hair accessories to secure the do, including pins with sparkles, flowers, beads, ribbons and jewels. Your glamour is guaranteed. Curls and accessories add instant elegance to long hair. For the long-haired lady who wears her hair up every day for practicality's sake and wants to let it be seen in all its shining glory, there are several ways to wear long hair with elegance and style. The Edwardian style is a wonderful romantic look, although difficult to do well by yourself. You twist even sections of your hair down the head, starting at the temples. Add sections of hair as you go, similar to French braiding. At the nape of the neck, secure the twists with a jeweled (or otherwise pretty) barrette. Add jeweled bobby pins or other accessories in the twists themselves to up the glamour and beauty, as well as keep them in place. A topknot keeps hair off your face while allowing most of it to hang loose and lovely. This simple look can be created by making a small ponytail at the top of your head and twisting it into neat coils. You might even make a few tiny braids first and then coil them. Secure with pretty pins. Similarly, you can gather the top portion of your hair and make a long braid starting from the top back of your head and secure it with a hair stick topped by a flower. This is a romantic, Pre-Raphaelite look that works even better if the rest of your hair is worn in loose curls. You can also wear your hair completely loose and in long curls. Use a good styling product on wet hair and either wrap your hair in thick curlers or create finger curls under a diffuser. Either way, finish with a light hair spray to keep the curls in place. Sleek and straight is also an elegant hairstyle-- the popular sedu look has been sported by many celebrities on the red carpet. All you need is a good ceramic straightener and a finishing product. Your hair will flow like a silk curtain around your head all night. Looking perfect for hours on end is all about product. Be liberal with your initial usage and bring a small container of extra product with you for quick fixes. You want to look amazing for as long as the event lasts! Any style can be elegant, and there are elegant hairstyles for every woman's hair. Whether you want a dramatic look or sophisticated simplicity, proper care and attention to detail will ensure you a glamorous result.